Salt Lake County is looking into allowing backyard chickens. Salt Lake City is already pro-chicken, as-is Provo. But in the incorporated areas of the county and in West Valley City, urban fowl are still a no-no, not that the regulation is always obeyed. Across the Salt Lake Valley, residents in numbers are buying chickens and building coops. IFA country stores reported that more chickens were bought in their Salt Lake City and Riverton stores than anywhere else in their chain. In response to citizen demand, the Salt Lake County Council is reviewing an ordinance that would make it legal to raise up to 15 hens. Coops would have to get a permit and an annual inspection by the chicken police. 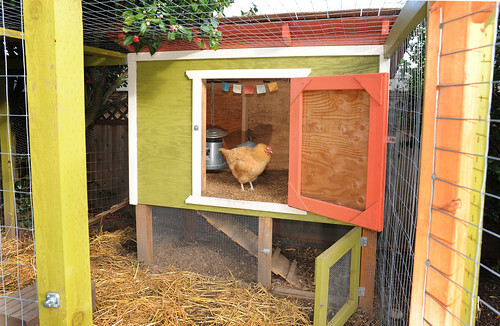 Prospective hen owners would have to notify neighbors within 300 feet. Chicken lovers argue that chickens make great pets, eat pesky insects, and promote sustainability in a bleak economy. Some animal rescue groups, however, think backyard flocks are a bad idea. Organizations in Minnesota, California, Vermont, Virginia and New York are worried about the welfare of urban fowl. They say they’ve been inundated with calls to take in stray and abandoned chickens and that limited resources make it impossible to find homes for the displaced fowl. Hopefully Salt Lake County’s chicken police will ensure that all coops are secure and all chickens contained within.